You must finish painting the water and reflections before painting the dead trees. Note how we paint reflections of trees before we paint the trees. In this painting lesson we will see how to paint reflections of trees in one color and white, but you must be aware that the different tones must be used in there right place to give us good depth, or you might say that 3 dimensional look. This scene can be painted in any dark color and white. I have chosen ultramarine blue. Keep plenty of white in your sky. 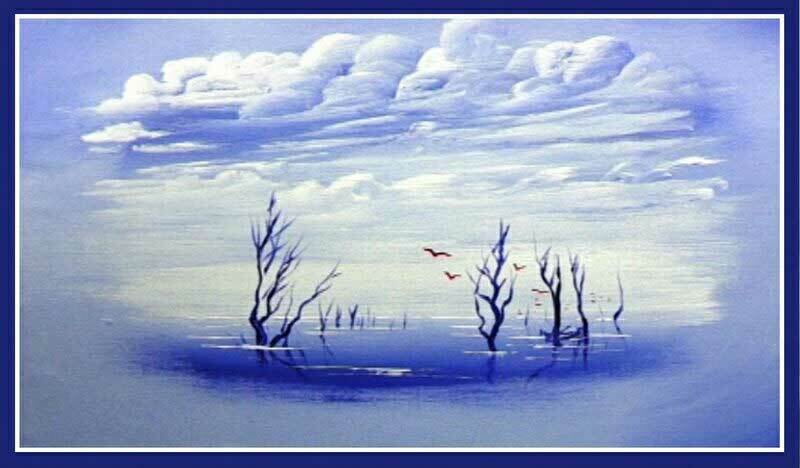 Play this tutorial video and learn how to paint reflections of trees in oils or acrylics..
Keep your horizon line low and straight. You may use masking tape to produce a straight horizon line. Practice the thin brush strokes before putting the fine branches into your picture. Have the foreground trees very dark to give us good contrast with the background. You may need to thin the paint to get those fine lines. We use a great technique of painting the reflections and ripples before we paint the trees. 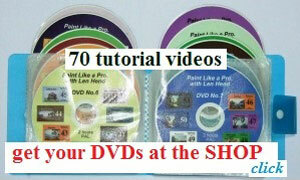 Go To – How to Paint Loose.